It is with shock and dismay that we receive distress calls from church leaders in Niger, concerning attacks targeting Christians. As this is happening, we continue to reel at the news coming out of Nigeria; killings of people and annihilation of entire villages and towns in Northern Nigeria by Boko Haram jihadists. We condemn these attacks and killings in the strongest terms possible and call on the African Union and the Security Council of the United Nations not to sit by and watch these heinous crimes continue. We re-echo the call and appeal of President John Mahama, of Ghana and current Chair of ECOWAS to speedily mobilize the region to move against militants in the region, in whatever shape or form, to save the people of Africa. Whatever is the pretext for the dastardly attacks on Christians in Niger, it is inconceivable to understand. Apparently, this connected with the Charlie Hebdo saga in Paris. It would be recalled that there was a jihadist attack on this newspaper/magazine outfit where some twelve people were murdered in cold blood. The perpetrators alleged they were avenging the prophet Mohammad. The identity of these killers and their claim to Islam, as in numerous and persistent similar attacks and killings, is always contested. After the attack on the magazine outfit, Charlie Hebdo, survivors of the magazine reacted by printing material clearly meant to avenge their dead and no doubt, intended to defile their aggressors. The Muslim world is offended by this act, seen as defilement not only of the jihadist but the religion of Islam as a whole. But the question is; what do God-fearing people do in the face of provocation? As a religion of peace, how do you promote peace in conflict and adversity? Can We only be peaceful when there is no conflict? Given the whole debate about the self-professed Islamic jihadists not being true Muslims, should the real Muslims not be circumspect in the way they vent out their anger; different from those who are supposedly claiming the Islamic religion falsely? Where then are the true Muslims? How does killing another human and defiling another religion build Peace in the World and honour own religion? 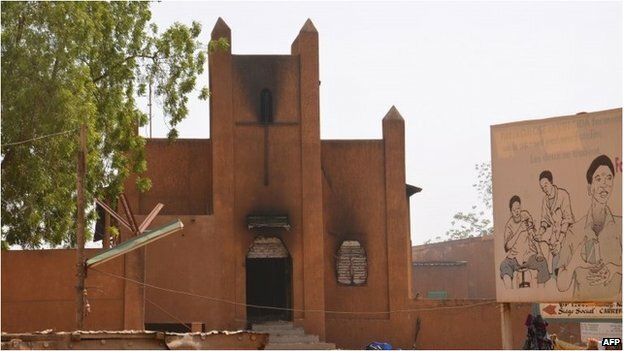 In any case, what is the connection with Charlie Hebdo and the Christian church in Niger? We are calling on the majority Muslims, to make every effort to reclaim this great and peaceful religion from the jihadist sects and distance true Islam from riotous conduct. Our prayers are with the affected communities in Nigeria and Christians in Niger, the God of creation will have mercy and hear our cries to establish is peace and reign in the troubled spots of our world. The Association of Evangelicals in Africa (AEA) was formed on 26th February 1966 at Limuru, Kenya, during a meeting of 102 evangelical Christian leaders from 23 African nations and missionaries from other countries. The meeting had been convened as a result of the felt need by the evangelicals for a permanent association which would help build a united movement of the Body of Christ that would promote evangelical unity, fellowship and Christian witness in Africa. In its 49 years of existence, AEA has grown into a continental family of over 100 million evangelicals comprising 36 National Evangelical Fellowships that are made up of numerous local churches. There are 34 Associate Members who consist of Para-Church organizations, and 11 Special Members representing local Churches in countries where there are no National Evangelical Alliances.